The SUN ‘n FUN International Fly-In & Expo will be celebrating its 45th year! Our event is a six-day aviation extravaganza that hosts over 500 aviation exhibitors, sponsors, advertisers and over 500 national and international media representatives. We welcome guests from all fifty states and from over 75 countries. upport to the best aviation event in the world. advantage of bundle discounts. Over 30,000 copies of the In-flight Guide and Expo Map will be produced. BUY TWO – Purchase two SUN ‘n FUN ad placements (not including SUN ‘n FUN Today!) and receive a 12% discount on the purchase of two ad placements. Agencies submitting contract and artwork will receive a total discount of 18% on two ad placements. BUY THREE – Purchase three or more SUN ‘n FUN ad placements (not including SUN ‘n FUN Today!) and receive a 20% discount on the entire ad purchase. Agencies submitting contract and artwork will receive a total discount of 25% on three ad placements. BUY EARLY and SAVE – Secure your ad placement with contract and payment by 12/31/2018 and receive an additional 10% discount. This discount is not available in combination with combo discount packages. 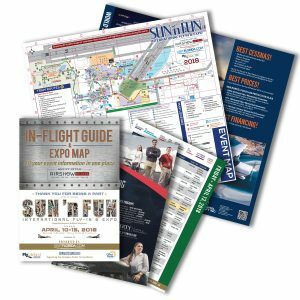 Please click here to download the 2019 SUN ‘n FUN Advertising Packet, it includes an “Advertising Opportunities & Information” section to this packet. It provides a bit more detail on the products included as well as our current statistics. We hope you will find this information useful when determining your advertising needs for the coming year. We look forward to assisting you with your advertising needs for SUN ‘n FUN 2019. Sponsors who advertise can receive special advertising opportunities and discount packages. Contact Greg Gibson in our Business Development office, he will be happy to assist with any questions you may have.